GEORGE V, 1921, London die. 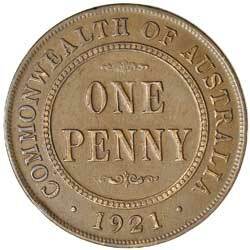 Very fine and scarce. 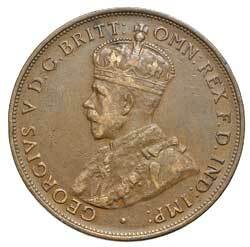 GEORGE V, 1920 dot above top scroll only, Indian die. Good fine and rare. GEORGE V, 1921, Indian die. Double entered obverse legend, glossy brown, nearly uncirculated. GEORGE V, 1922, Indian die. Nearly extremely fine.